2013 - The Big Freeze! - Chiyoko & Guy's Photo Site. 2013 - The Big Freeze! Early December 2013 was one of the coldest weather periods we have had in over 25 years. For 10 consecutive days we had night time lows below freezing & for 5 consecutive days we were below freezing day & night! I know for many of you in other parts of the world would not consider these temperatures to be cold at all, for us here in balmy zone 8 Oregon they were a big deal! Over the next few months we will post photos here of what survived & what didn't! All blog posts relating to this photo gallery & our Winter freeze can be found here. 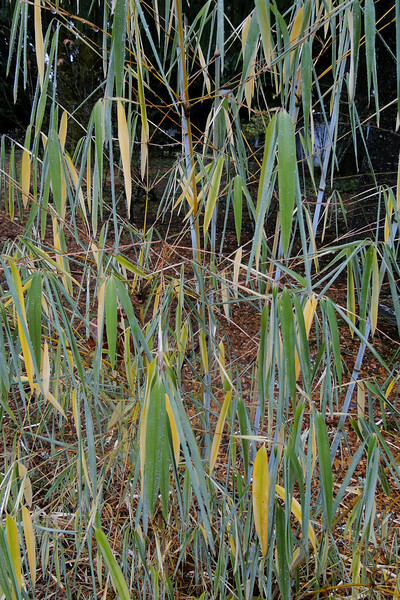 Our Borinda papyrifera isn't looking to happy a few days after the freeze! It's frozen to the ground in temperatures not as cold before so we don't expect the top to survive but hopefully it will come back from the roots again.